'heima' is sigur rós's first ever film, filmed over two weeks last summer when the band undertook a series of free, unannounced concerts in iceland. they hauled 40-plus people round 15 locations to the furthest flung corners of their homeland for their debut venture into live film, to create something, well, inspirational. 'heima' (icelandic for "at home" or "homeland"), truly, shows sigur r�s as never before. whereas seeing the group live is normally a large-scale and sometimes overwhelming experience, making full use of lights and mesmeric visuals, 'heima' was always intended to reveal more of what was actually going on on stage. it does this via long-held close-ups and a rare intimate proximity, without ever once breaking the spell. 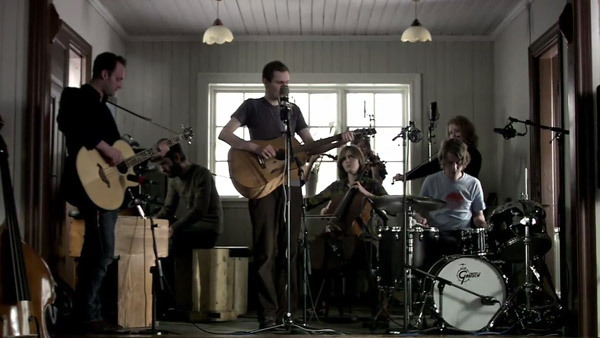 'heima' features performances of songs from all four sigur r�s albums, many radically reworked, as well as two exclusive new songs in 'guitardjamm', which was filmed inside an abandoned herring oil tank in the far west of the country, and the traditional 'a ferd til breidarfjardar 1922', performed with poet steindor andersen. on november 5th (november 20th in america) 'heima' will be released as a special edition double dvd package with a 116-page book containing stunning photos from the tour. it will also be released as a standard 2-dvd set. the first disc of both packages features the 'heima' film, with a choice of a 5.1 surround sound or pcm stereo mix, whilst the second dvd will contain the full performances of each song in the movie amongst many other extras.